Six young women (Sima Mobarak-Shahi, Shayesteh Irani, Ayda Sadeqi, Golnaz Farmani, Mahnaz Zabihi, Nazanin Sediq-zadeh) have something in common: they all want to see Iran play against Bahrain in the qualifying match for the World Cup. They have another thing in common: despite their disguises (including one cleverly dressed as one of the guards) they’ve all been caught trying to enter the stadium, where women are forbidden. Kept in a holding area under the supervision of guards who’d rather be watching the game themselves, they plead their case, try to get game updates, and deal with having to use the bathroom in a building that has no such facility for their gender. This isn’t the first film I’ve seen dealing with gender discrimination under Iran’s laws and culture, but it is the funniest. Pahani takes a tragically unfair situation — people unable to express their national pride and love of sport in their chosen matter — and mines it for terrific little slices of comedy, with a cast of characters you root for. In one absurd conversation, one of the girls tries to get the guard in charge to explain why these rules exist. The best he can come up with is they might hear swearing inappropriate for their delicate ears. As she hammers away skillfully at his argument, he gets flummoxed. Later, we hear the guards swearing themselves. 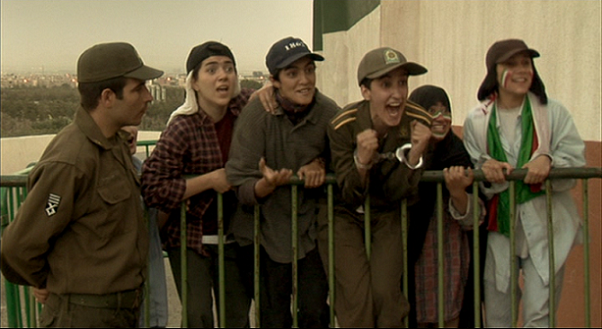 Panahi assembled a terrific group of non-professional actors and imbued them with wonderfully relatable personalities, girls and guards alike. You instantly care about these people, and grow to care about them more as little bits of their lives and attitudes emerge. Much of the film is shot during the event itself, filmed with a bit of permission and a bit of deception. Most notably, the jubilant ending is a document of the actual celebration in the streets. It’s a fantastic moment, and even as someone who cares very little about sports (especially soccer) I couldn’t help getting caught up in the excitement… knowing what it meant to these young ladies, even if they never achieved their goal of bypassing an unfair system. It’s interesting to think that it could have been a very different ending if the actual game had gone the other way. This entry was posted on January 22, 2013 at 8:31 pm	and is filed under Movie Reviews. You can follow any responses to this entry through the RSS 2.0 feed. You can leave a response, or trackback from your own site.